Dubbed “Tecmo Bowl Throwback,” the game is a remake of the NES classic, complete with HD graphics and an updated soundtrack — it also retains the original plays and team stats. And for those of you who fear the fancy-schmancy graphics of high-def games, Tecmo is also including an option to play Tecmo Bowl in its original state. … and whether he’ll get his own line of shoes. The night after the iron bowl this year I got out my NES and played super tecmo bowl with my 10 year old nephew who bleeds orange and blue. Not only did he show apathy towards Bo he was not impressed by me running a 99 yd td against him with Bo on the first play including doing several circles around his players. Geez, kids today. 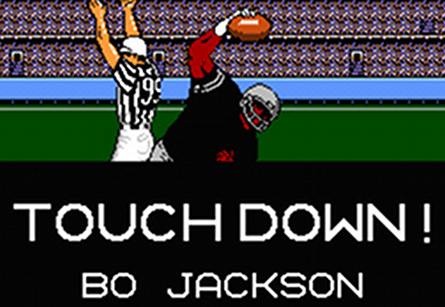 If I had 3 wishes from a Genie in a bottle, one would be that Bo would have never gotten hurt in the NFL. I’d wish that Bo was granted indefinite NCAA eligibility.